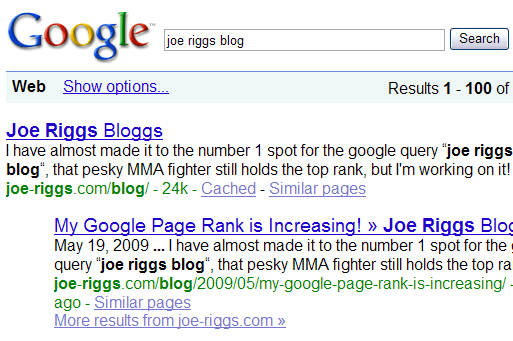 My Google Page Rank is Increasing! 1) Content. There’s no way around this, if you want google to rank your page, you need to give its robots something to rank. The more content you have, the better off you are. Along these lines, it helps to have dynamic titles that reflect the current page, this also helps people who are searching see relevent information, since google lists the page’s title as the url to your website. 2) Backlinks. These are links to your page from pages outside of your website. The kind you need are those that do NOT have the ‘nofollow’ attribute. Nofollow tells the googlebot not to add these links to its index, you may have noticed your links in comments on wordpress and many other ‘social’ websites contains these type of links. There are many free ways to get good backlinks. Many forums and social sites such as facebook and digg allow you to post a link to your site. Another way is to reach out to fellow content authors to see if they would be interested in trading backlinks. To do this, you will need a links section on your own website. 3) Register. All of the major search engines have provided a place for you to tell them about your site. For example, here is google’s. Google even has a webmaster application that will give more detailed information about how they ‘see’ your site, I highly recommend using it, plus it’s free. Of course page ranking is a major business on the internet, and for many companies out there this is their specialization. But, I find that these simple, honest techniques will help most small sites out there get some page-rank love too. Edit: I just hit #1 with this post (05/19/09)! Wonder how long this will last..
m a real estate agent in Washington state & it seems that I spend more time trying to understand the Google dance than I do the local real estate market. At any rate your points are well taken – content is king. We are making a change on our web site relative to our blog so that blog posts will be catagorized into subject matter which will automatically be posted on the corresponding pages of our web site. We have also added the “nofollow” plugin to our wordpress blog & have aggressively posted to similar blogs. A lot of work but the reality is if you are not one of the 1st two on the 1st page of google with a search using your key words, you may as well not be there at all. Thank you for sharing this valuable insight. At the moment, I’m still learning how to increase my page ranks through backlinks. I owe you..